If you’ve got any questions about the past eight decades of life in Abiquiú, this is the man to see. Ghost Ranch canyonlands. Abiquiú Lake and Cerro Pedernal at the far right. Napoleón Garcia has a loud voice and a cowbell, and he’s not afraid to use them. In fact, you’re more likely to hear Napoleón before you ever see him. He’s the man in the house on the corner of the plaza in Abiquiú, the house with the blue railing and the green door, the one with the sandwich board sign out front reading TOURIST INFORMATION. From his porch, Napoleón looks out over the plaza, and if he sees tourists, he’ll call out to them or ring his cowbell to get their attention. Then he invites them onto his enclosed porch, where he talks about the history of Abiquiú, about the traditions and the feast days celebrated here, about the distinctive cultural identity of the Genízaros, about the work he did as a young man for Georgia O’Keeffe, about the time he met Charo, and anything else that comes up. So I called Napoleón’s wife on the phone to arrange an interview, and I told her I couldn’t wait to meet him. But I wouldn’t have a choice. My timing was off. Napoleón was in Albuquerque, recovering from a fall. At age 83, his recovery was progressing steadily—driven, in large part, by his desire to get back to work talking with tourists. He was getting stronger every day, but he would not be home for another month. A delay, surely, but also an opportunity for me. What better way to understand what Napoleón does, I thought, than to go up to Abiquiú before meeting him to get the lay of the land? The beauty of the Río Chama Valley, in north-central New Mexico, is unmistakable—any drive through it, at any time of year, is a reward for being alive. Undulating brown hills freckled with plump green piñon and juniper trees. Horses grazing in fields lined with cottonwoods. Fog along the river on crisp autumn mornings, giant white clouds filling the sky in the summer. An artist’s paradise. Anyone’s paradise. Two-lane US 84 seems to glide along the valley, not fighting the winding turns of the river but flowing with them in harmony, like a second river itself. Just past Abiquiú, the road passes vermilion cliffs so stunning that the pullouts along the way must surely have been placed to give motorists a chance to catch their breath. From almost every angle, the endearingly lopsided Cerro Pedernal mesa is visible, her amiable presence as welcoming as a grandmother’s apron. I hiked the trail to Chimney Rock at Ghost Ranch one morning. A solitary bird in the canyon, auditioning for the role of Madame Butterfly, provided the inspiration I needed to reach the top. I was the only one up there; the view, mine alone to admire. I felt it was my personal responsibility to appreciate every detail of the panorama before me: the giant mesas, the shimmering waters of Abiquiú Lake in the distance. Out over that eternal landscape, history has added another layer. Back in 1754, Governor Tomás Vélez Cachupín granted land here and designed it as an outpost for protecting settlements to the south. The grantees, and the first settlers, were Genízaros—Native Americans who had been taken captive and raised as servants in Spanish households, often baptized, and freed when they reached adulthood. Abiquiú retains that heritage today, and its resources are still managed by its own land grant board. Historically, Abiquiú was a boundary between a world that was known and safe and one that was unknown and mysterious. Maybe it still is today. Outside the window of the house I stayed in at night, I could see lights bobbing through the trees along the river, lights I couldn’t identify. A layer of spirituality exists here, certainly. The ruins of the historic Santa Rosa de Lima remain, about two miles east of the village. On the plaza is the Santo Tomás el Apóstol church, where the Sunday service alternates between Spanish and English. Dexter Trujillo rings the bells here, three times on Sunday mornings for Mass. He’ll ring them as well if someone in Abiquiú passes away—by tradition, one toll for each year of the person’s life. The chimes make a plaintive but gently beautiful sound as they echo over the plaza, here for a moment, then softly gone. Across the river is the Dar al Islam mosque, and Presbyterians run the retreat center at Ghost Ranch, a few minutes up the road past the village. Farther north along the river is the Monastery of Christ in the Desert, which I made my destination one morning. Cerro Pedernal kept me company for the first part of the lonely drive, until the tumbling waters of the Río Chama took over and guided me safely to my destination. Inside the monastery gift shop, two monks were fussing over a stapler that wasn’t performing as desired, a moment I will revere forever for its sheer ordinariness. Two candles burned inside the octagonal chamber of the church itself, which was bright with the sun and quiet except for the knocks that sounded every few moments as the walls adjusted to the accumulating warmth of the day. In Abiquiú, there is another layer, left by a woman who found her own communion with this country. She’s still here, her memory as strong as if she had become part of the land she venerated on her canvases. Not the rough-and-tumble landscape of the westerns being shown in movie theaters, but a land of ethereal beauty, soft forms that invite abstraction, a landscape of elegant geometry. In sharing her unique view of this world, Georgia O’Keeffe proved that the landscape of Abiquiú requires individualism, and also rewards it. O’Keeffe lived first at Ghost Ranch, then bought a house in Abiquiú itself in 1945. I was able to visit that house one morning. My host was Agapita “Pita” Judy Lopez, who was O’Keeffe’s employee for many years and who still speaks of her with reverence. The house was as quiet as the monastery, and just as calming. You can feel O’Keeffe’s presence in the simplicity of the lines that compose the furniture, the walls, the beams overhead. It’s there in the negative space, indeed in the very stillness of the house itself. There are collections of small stones throughout, on windowsills and over her bed frame. When she found a stone with a shape she liked, she brought it home to keep. I was surprised to see a stereo system, which she used to play Mendelssohn and Bach, and a dishwasher in the kitchen—they seemed strangely out of place, strangely modern. And yet, on a roof beam in the small herb room off the kitchen, part of the original house on this site, Ms. O’Keeffe left intact the inscription reading LE TECHO HOY 5 NOV 1865. It’s only a short distance up the road from O’Keeffe’s house to Napoleón Garcia’s. Napoleón Garcia&apos;s home on the plaza. Some houses in Abiquiú are grand in size, and some are grand in spirit. Napoleón’s is a little of both. And nowhere is that spirit more evident than on the porch, which doubles as his workshop, and triples as his personal visitor center. Adorned with hand-carved crosses, walking sticks and canes, photographs, ristras, and plenty of etcetera, the porch is a delightful landscape of peculiar things. Sitting on that porch, I visited with Analinda Dunn, Napoleón’s wife, who told me the story of how they met one day back in 2006, she a tourist photographing the church on the plaza and he doing what he does still today: welcoming people like her. Analinda took me through their garden of corn and tomatoes, left unharvested this year with Napoleón unexpectedly away, to show me the acequia running just behind their house. It’s the one that has carried water through the village from Abiquiú Creek for generations, the same one that waters the gardens of the O’Keeffe house. Back inside, she emptied piles of letters onto the living room table, postmarked from Arizona, Oregon, Wisconsin, even France and Japan. Each was a note of thanks from a visitor to Napoleón for his kindness in talking with them, singing songs, sharing history. “I think it is a revolutionary act to tell old stories,” one letter read. I signed the guest book on the porch before leaving. Mine was the first entry in two months. Around the corner is the gallery and home of Napoleón’s oldest son, Leo, known as the “Gentle Giant.” I entered his Galería de Don Cacahuate to the warm smell of beans cooking on the stove. True to his nickname, Leo towered over me, but his frequent laughter easily negotiated the distance. He showed me his painted wooden carvings of skeletons and other fantastic figures, while I admired the devotion behind every brushstroke. I remembered the beautiful corn-husk crucifix I had seen hanging at the Santa Rosa de Lima church and wondered if Leo might know the artist. But I didn’t ask. Not everything about this place, I realized in that moment, was mine to know. I was ready to meet Napoleón. The meeting happens a month later. Napoleón is home, recovering. I ring the doorbell on the porch, the one above the cowbell, and Analinda welcomes me again. There are two Napoleóns waiting to see me in the kitchen. One sits in a wheelchair with his deep eyes smiling; the other sits on the kitchen counter looking pensively into the distance. The second Napoleón, the one on the counter, is a portrait of the man, sent to him by an admiring fan. For the rest of the afternoon, the portrait remains in the background just behind its subject, and seeing the two together, I get a strange sense of double vision. The real Napoleón, sitting before me, is dressed in traditional Spanish colonial clothing, a white shirt with red sash, and a black hat. His goatee is neatly trimmed against his strong jaw, and a necklace and cross dangle from his neck. He starts with a joke. Napoleón has lived here in Abiquiú almost all of his 83 years, except for a brief time in Utah for the National Guard. As a child, he lived in another house. But after marrying Emma Rose Garcia, his first wife (who passed away a decade ago), he moved into the house on the plaza, then owned by his father-in-law, who gave it to the couple on the condition that he keep it in the family. He raised nine kids here, working as a subcontractor at Los Alamos for 35 years. “How has Abiquiú changed?” I ask him. The houses are where they’ve always been, he tells me. Water still runs through the acequia, residents still gather firewood from the mountains, the hermanos in the moradas still pray for the dead and comfort the sick and grieving. He remembers the construction of the Santo Tomás church, replacing an older structure, back in the mid-1930s. He even helped the workers. In his adult life, Napoleón has served as mayordomo for the church several times, taking care of the building for a year, protecting the santo and keeping it in his house, tending to special functions. The mayordomo is also in charge of the feast day that year, until selecting a successor and transferring the keys to the church on the last day of the fiesta. Abiquiú has two feast days—the first one of European heritage, the other Native American. “There was a little carnival,” Napoleón recalls of the Fiesta de Santa Rosa de Lima during his youth, held in August. “Lots of people from everywhere would come. The celebration lasted two or three days.” And like they do today, vendors would set up booths and people would sell vegetables, jewelry, wood carvings. They had horse races and a merry-go-round. “There used to be trucks selling ice cream,” Napoleón recalls. “We’d save a few pennies that Alfredo Maestas, owner of the bar, would give us. He used to pay us 25 pennies for a day’s work peeling latillas.” Mr. Maestas, Napoleón recalls, would jokingly call the kids, saying, “Vengan, ladrones!”—Come, thieves!—and then distribute their day’s wages. It was the only chance Napoleón had as a child to treat himself to ice cream. I want to know about his mother. She raised four kids on her own, working odd jobs to keep her family fed. Disciplined, he recalls, but, in his words, “happy-go-lucky.” As a kid, he hid from her under the bed, but she would prod him out with the handle of a broom. She lived to be 103. I ask for his version of the story of how he met his current wife. The sun is warm on my neck, and the birds in the next room are singing sweetly in their cage. It’s easy to be here, easy to listen to the stories. I understand why so many people reach out to Napoleón to thank him after he spends time with them. Sometimes, he tells me, visitors come and take pictures by his house. But they don’t come in. So he’ll call out to them, or use his cowbell. “Why?” I ask, laughing. “So they’ll pay attention!” he explains. There is a video of Napoleón in the Pueblo de Abiquiú Library and Cultural Center that shows him visiting with kids on his porch. Filmed in 2008, the Napoleón on video is in his element, telling the kids about their Genízaro heritage, answering their questions about his art. In the midst of all this, Napoleón raises his head to address a woman off camera he sees outside his porch, asking her if she needs any help. She, like so many others who visit, asks where to find the Georgia O’Keeffe house. Many in Abiquiú knew O’Keeffe or have stories about the artist; some even worked for her. As a young man, Napoleón did occasional work in her garden and also drove her places. I ask him about his time with her and am rewarded with a cautionary tale about temptation. A hint of mischievousness flickers in his eyes, and I suspect I know where this story is going. Indeed, with no words, Napoleón mimes tossing something into his mouth. His sly smile makes me feel I’m an accessory to the crime. “I ate it,” he confessed. His youthful honesty, in this case, came at a price. “She told me off,” he chuckles. “And she fired me.” It was the first time he was fired, but it wouldn’t be the last. He would get fired “four or five times” over the time he worked for the artist. But in every case, O’Keeffe would visit his house in subsequent days, she’d suggest they put the incident behind them, and things would go back to the way they were before. He remembers the artist’s generosity to the village. She helped provide for community needs and sometimes offered to pay a resident’s medical bills. She liked to hear the singing, he tells me, the songs of praise, sung by the brothers from the morada as they walked in procession to the church during fiesta. That’s why, as soon as he recovers, he plans to be back on his porch. He reaches out to take my hand, and his palm is as warm as the gesture itself. Walking me out, Analinda rings the cowbell at the front door, a boisterous metal clang escaping into the crisp air. And an effective one: It catches the attention of a man taking a photo of the church across the plaza. That bell is raring to get back to work. Abiquiú is quiet in the early evening, and I pause on the plaza to listen for the long-ago sounds of Napoleón and other kids out here yelling, but there is only silence. Actually, some things have changed in Abiquiú. Gone are the hornos, the outdoor ovens that once could be found in almost every yard. On the bulletin board at Bode’s General Store, you’ll find notices of upcoming yoga classes next to advertisements for hay for sale. Fortunately, change offers a salve to soothe its own disruption: It can make us more aware of what hasn’t changed, of what has lasted. The land. The great art made here. One man’s indomitable spirit. 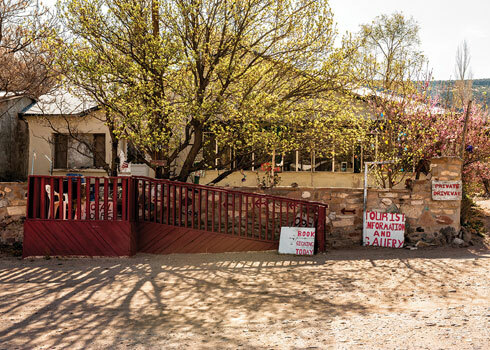 Contributor David Pike is writing a series of articles about small-town New Mexico.